The WC155 LAN extender provides high performance LAN extension over fibre function. The WC155 is virtually a 'plug and play' device with configuration options selectable on bit switches, in the unlikely event that non default operation is required. The WC155 product has now been superceded by the much more flexible and fully manageable MetroCONNECT WCM5100 product which offers advanced functionality. The WC155 is no longer available. With the need to extend, or interconnect, communication infrastructures over greater distances, and the cost of fibre falling dramatically, the Metrodata WC155 Fibre Converter product range provides a cost effective solution for the extension of Ethernet networks over STM-1/OC-3 services. The WC155 has a 10/100BaseT user port, supporting auto-negotiation and automatic MDI/MDI-X crossover switching by default, though full manual control is available via bit switches. The user port will perform MAC address based filtering of local packets and will forward all other packets. The WC155 offers full wire speed, full duplex operation even for minimum 64 byte packets, which for 100baseT is 148810 packets per second. In more complex installations using VLANs, the WC155 supports large frames up to 1536 bytes thereby allowing the transport of VLAN tagged packets. The WAN port is presented as a duplex SC fibre port with a choice of fibre transceivers available. This port supports either SONET OC-3 or SDH STM-1 framing at 155Mbps. LAN traffic is transported using the GFP (Draft Rev 2 ANSI T1X1.5) standard which requires the full OC-3 or STM-1 bandwidth to transport the user LAN traffic. Using fibre optics the WC155 products extend the operating distance for a 10/100baseT interface to 5km using multimode fibre, or to either 30km or 70km using singlemode fibre. Despite these quoted maximum operating distances for the WC155 products, specific installations may only operate over lower distances due to the variations in losses of different types of fibre cable, the use of connecting fibre cables, or patch panels. When operating over 50% of the maximum distances it is advisable to calculate all fibre optic connector and cable losses and compare these with the fibre optic loss budget specified for this product. The WC155 supports a maximum packet size (MTU) of 1536 bytes which is sufficient to transport double VLAN tagged frames (Q-in-Q). For critical applications, an external alarm relay is provided to indicate power failure and WAN port alarm conditions. LEDs also indicate unit status. The standard WC155 is supplied with SC fibre connectors and operates at a nominal wavelength of 1300nm. Other wavelengths are available on request, e.g. 850nm, 1550nm, 1550/1300 WDM. Other connector options are also available on request, e.g. ST, FC. 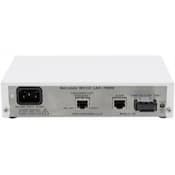 The WC155 has integral mains or 0 volt power supply, and can be desktop or rack-mounted. The WC155 range can easily be rack mounted in either a 1U two unit rack mount kit, a 6U eighteen unit rack mount kit. The WC155 is part of a range of products from Metrodata, offering fibre conversion solutions ranging from 2Mbps up to 155Mbps for electrical to fibre conversion, or 155Mbps, 622Mbps or Gigabit Ethernet for fibre mode or wavelength conversion. This application shows how a pair of WC155/MM units can be used to connect a 10/100baseT Ethernet link across an STM-1/OC-3 leased line service delivered using multimode fibre. This application shows how a pair of WC155/SMSH units can be used to connect a 10/100baseT Ethernet link across an STM-1/OC-3 leased line service delivered using singlemode fibre. This application shows how a pair of WC155/SMLH units can be used to connect a 10/100baseT Ethernet link across an STM-1/OC-3 leased line service delivered using long haul singlemode fibre. The WC155 product has now been superceded by the much more flexible and fully manageable MetroCONNECT WCM5100 product which offers advanced functionality. The WC155 is no longer available.